Pain On Top Of Your Foot? When people experience pain on top of their feet, they often notice it not getting better or even worsening over time. Although there are several things that can cause pain on top of the foot, one of the most common is from a stress fracture of the foot. Stress fractures are tiny microfractures that occur in the foot bones. Most of the time, it occurs from performing repetitive motions such as running but can be caused from high impact activities too, like aerobics. Although stress fractures can be difficult to diagnose, there are clinical signs that can help us determine if you are possibly suffering from a stress fracture. 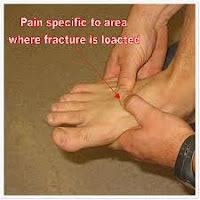 Localized pain on top of the foot along the toe joints, arch or midfoot very tender to touch can be a sign of a fracture. Sometimes the area can appear swollen or warm compared to the other foot as well. If you are suffering from pain on top of your foot, call Advanced Podiatry today at 813-875-0555 for an appointment to one of our doctors for an evaluation! Are You Experiencing Foot Pain After Running? Pain In The Ball Of Your Foot Causing Major Problems?